Yesterday a group of activists joined representatives from Canada’s First Nation communities to protest against RBS’s continued funding into Tar Sands. 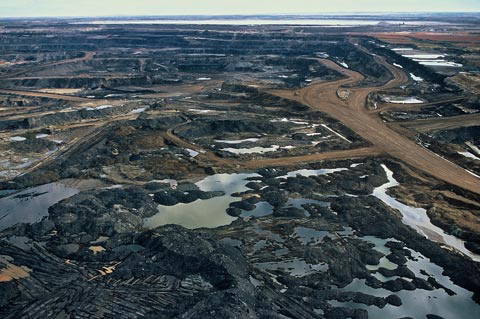 Tar sands is a particularly oily soil which is extracted by using huge open pit mining, price leaving huge 75 meter scars in the wake or by ‘In Situ mining’ which requires huge amounts of natural gas to operate. Tar Sands extraction is also the dirtiest forms of oil, sildenafil producing 3 to 5 times as much Co2 per barrel as conventional oil, ambulance which shows a desperate attempt by corporations and governments to profit from oil no matter the cost to the environment. 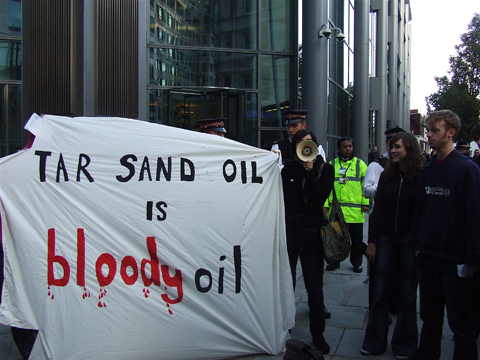 These ‘oil sands’ are found predominately in Canada, which means the US can look to have less reliance on oil from conflict regions such as the middle East. However it doesn’t stop them trampling over Indigenous communities in Canada, polluting the soil, water, turning forests and ecosystems into desolate wastelands and pushing groups of people that have lived sustainably for hundreds of years into extinction. The three women also from the First Nation communities had previously attended a meeting in Parliament to deliver an open letter to the Chancellor, Alistar Darling outlining the threat to their homes and were later planning to deliver the letter to an RBS representative. Shouting and using megaphones they got their messages across and thanked all the people for coming down and showing solidarity with the movement. 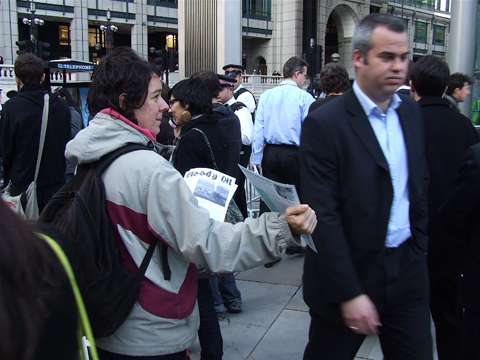 Role-playing, shouting and mass dying everyone else on the protest organised by People and Planet, aimed to get their message across on the busy street, plenty of leaflets were also handed out even a fair few press turned up as well as the bankers themselves coming out for their lunch. 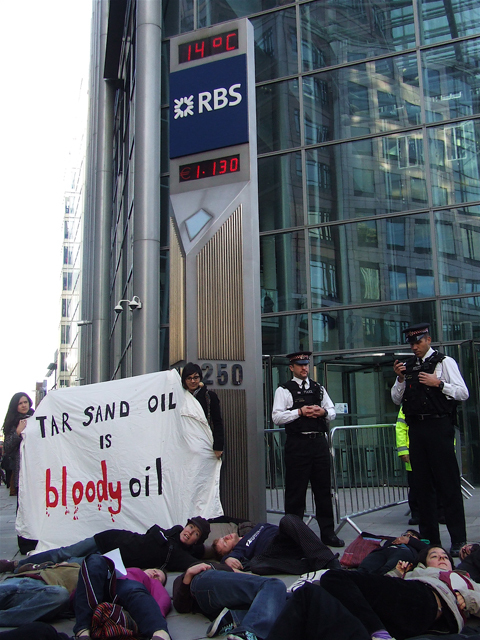 RBS is one of the big payers investing into Tar Sands, which they plan to expand production on over the next few decades. What is worse is that RBS is public owned since the banks bailout in 2008. We are effectively funding human rights abuses from Tar Sands extraction through our taxes and our treasury. 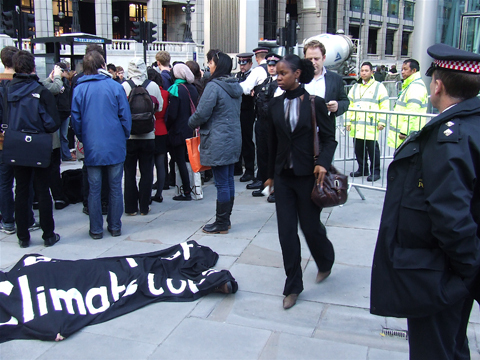 The protest yesterday was calling for RBS to shift investments away from projects like the tar sands as well as investment into things like the controversial new coal power plants planned by e-on. A few of the bankers obviously found it really funny that people would choose to lie on the street and not, instead wear a suit and tie and play with peoples money in the stock market, but hopefully with the continued presence outside the bank hopefully something might start getting into their heads. 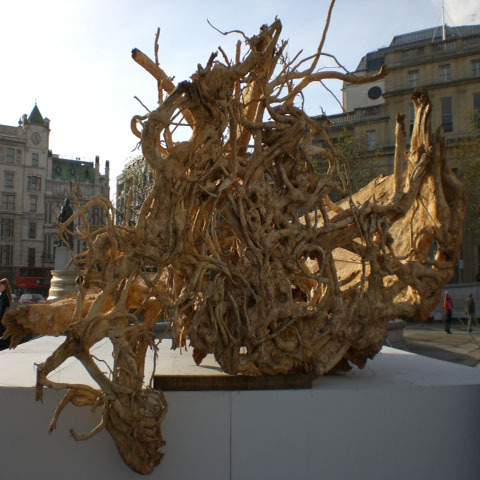 Ghost Forest in Trafalgar Square is a well-timed art-installation taking place ahead of the UN conference on Climate Change from December 7 to 18, prostate involving 11, viagra 40mg 000 delegates from 192 countries. Ten tree stumps selected from seven indigenous species all with delightful exotic names are represented – Denya, viagra sale Dahuma, Danta, Hyedua, Mahogany, Wawa and three varieties of Celtis – and have been placed at the feet of the National gallery, right at the very centre of Western Industrialization. They are all with a rich and varied ecology and all with equally diverse uses by man; the Celtis Adolfi-Friderici is evergreen, but many of its leaves do fall during the dry season. It grows up to 100 feet tall and is of abundant forest availability. 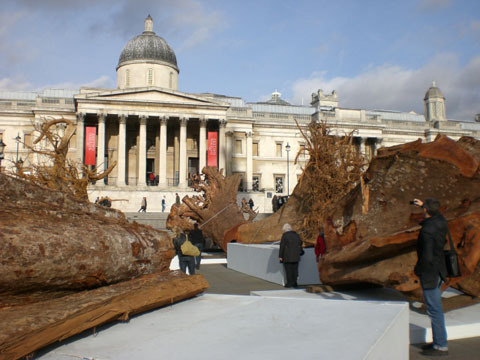 Celtis and its friends do not end their epic journey in London; having traveled all the way from the tropics, they will travel to Copenhagen to remind UN employees that the removal of the world’s ‘lungs’ through continued deforestation needs to be dealt with without delay. Angela Palmer is an artist with convictions: “Many thinkers maintain that all art is political; politics touches all aspects of our lives. Life is about politics. 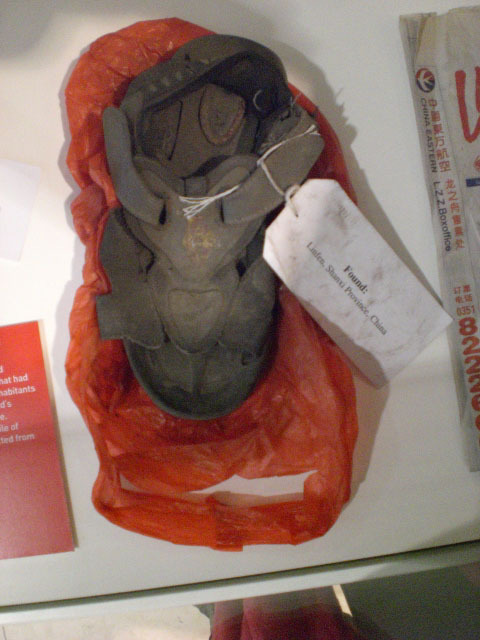 And art is about communication, often transmitting unpalatable truths.” Breathing In, currently at the Welcome museum from the 20th of October to the 22nd of November 2009, is another one of Palmer’s projects currently in the capital. 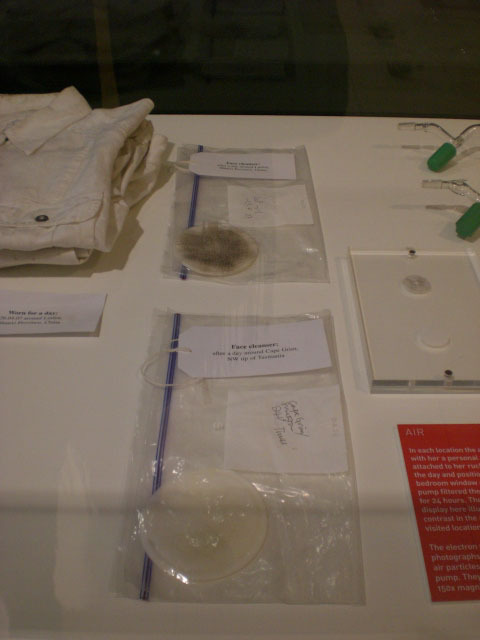 In April 2007 Palmer travelled to Linfen in Shanxi Province, China, home to the most polluted air on Earth, and then to Cape Grim on the northwest tip of Tasmania where there’s the purest air and water on Earth. The exhibition is a straightforward display of the results of her journey to capture the physical properties of climate change. The evidence is undeniable- the previously white outfits worn for a day now blackened by the unhealthy Linfen air, the dark face cleanser pads and air pump filters…the facts are brutal. There is an uneasy juxtaposition between the pristine green luscious Tasmanian rainforest and the cloudy, polluted, dusty and overpopulated Chinese streets. Angela Palmer’s art is good medicine for anyone still wondering what all the fuss is about Climate Change. You leave the building wanting to help a worthy cause.